The San Diego Padres visit Dodger Stadium on Wednesday, September 27, 2017 to play the Los Angeles Dodgers. The probable starters are Clayton Richard for the Padres and Rich Hill for the Dodgers. The opening line for this matchup has San Diego at +171 and Los Angeles at -181. The Padres have a 78-71-8 over/under record and a 84-73-0 run line mark. 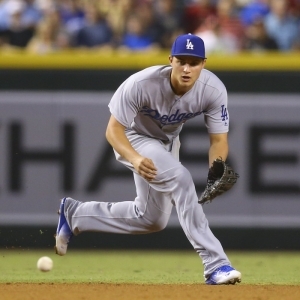 The Dodgers are 76-80-0 against the run line and have a 65-81-10 over/under record. The Padres have a 70-87 overall record this season. Starting pitcher Clayton Richard has a 8-14 record with an earned run average of 4.63 and a WHIP of 1.50. He has 144 strikeouts over his 192.1 innings pitched and he's given up 232 hits. He allows 10.9 hits per 9 innings and he has a FIP of 4.21. The bullpen has an earned run average of 4.44 and they have given up 475 base hits on the year. Teams are hitting .233 against the bullpen and they've struck out 573 hitters and walked 196 batters. As a team, San Diego allows 8.8 hits per nine innings while striking out 8.3 batters per nine innings. They are 19th in the league in team earned run average at 4.6. The Padres pitchers collectively have given up 1,363 base hits and 710 earned runs. They have allowed 219 home runs this season, ranking them 5th in the league. San Diego as a pitching staff has walked 533 batters and struck out 1,288. They have walked 3.5 men per 9 innings while striking out 8.3 per 9. They have a team WHIP of 1.37 and their FIP as a unit is 4.65. As a team San Diego is hitting .234, good for 30th in the league. The Padres hold a .395 team slugging percentage and an on-base percentage of .300, which is good for 30th in baseball. They rank 30th in MLB with 7.7 hits per game. Wil Myers is hitting .243 with an on-base percentage of .330. He has 134 hits this season in 552 at bats with 73 runs batted in. He has a slugging percentage of .464 and an OPS+ of 110. Manuel Margot is hitting .270 this year and he has an on-base percentage of .321. He has totaled 127 hits and he has driven in 39 men in 470 at bats. His OPS+ is 98 while his slugging percentage is at .421. The Padres have 1,211 hits, including 220 doubles and 185 home runs. San Diego has walked 451 times so far this season and they have struck out 1,456 times as a unit. They have left 1,000 men on base and have a team OPS of .694. They score 3.79 runs per contest and have scored a total of 595 runs this year. Los Angeles has a 100-57 overall mark this year. With an earned run average of 3.50, Rich Hill has a 11-8 record and a 1.12 WHIP. He has 156 strikeouts over the 128.2 innings he's pitched. He's also given up 97 hits. He allows 6.8 hits per nine innings and his FIP stands at 3.85. The bullpen has an earned run average of 3.44 and they have given up 443 base hits on the year. Teams are hitting .220 against the Dodgers bullpen. Their relievers have struck out 609 batters and walked 174 opposing hitters. As a team, Los Angeles allows 7.6 hits per nine innings while striking out 9.7 batters per nine innings. They are 2nd in the league in team earned run average at 3.39. The Dodgers pitchers as a team have surrendered 1,182 base knocks and 528 earned runs this season. They have given up 177 home runs this year, which ranks 24th in Major League Baseball. Los Angeles as a staff has walked 428 hitters and struck out 1,507 batters. They give up a walk 2.8 times per 9 innings while they strike out 9.7 per 9. Their team WHIP is 1.15 while their FIP as a staff is 3.64. As a team, they are batting .248, good for 22nd in the league. The Dodgers hold a .436 team slugging percentage and an on-base percentage of .333, which is good for 8th in baseball. They rank 24th in MLB with 8.3 hits per contest. Cody Bellinger comes into this matchup batting .272 with an OBP of .355. He has 126 hits this year along with 94 RBI in 464 AB's. He maintains a slugging percentage of .595 with an OPS+ of 146. Justin Turner is hitting .321 this season and he has an OBP of .414. He has collected 142 hits in 442 at bats while driving in 70 runs. He has an OPS+ of 150 and a slugging percentage of .534. The Dodgers as a team have 1,301 base knocks, including 301 doubles and 214 home runs. Los Angeles has walked 625 times this season and they have struck out 1,347 times. They have had 1,107 runners left on base and have an OPS of .769. They have scored 4.71 runs per contest and totaled 739 runs this season. Who will win tonight's Padres/Dodgers MLB game against the spread?